The BSA have chosen the winner of the design contest for the 100th Anniversary of the Boy Scouts of America. After careful consideration by the Anniversary Logo Leadership team, the total entries were pared down to approximately 500 semifinalists. From there, our panel of 11 select judges scored the semifinalists to provide input on determining the category and overall winners. These judges carefully reviewed the creative merit of each entry and the inspiration articulated in the accompanying essays. Among the thousands of outstanding submissions, Eagle Scout Philip Goolkasian’s entry eventually emerged as the design that captured both the history and future of the Boy Scouts. Philip is an Eagle Scout from a troop in Sequoia, California. While the weather hurt walk-in traffic at the Sakuwit Lodge #2 last weekend, there was a couple of discoveries made and I did fill in a few needs. Juan Gonzalez found a previously unlisted event patch from Buckskin Lodge’s Matinecock Chapter. 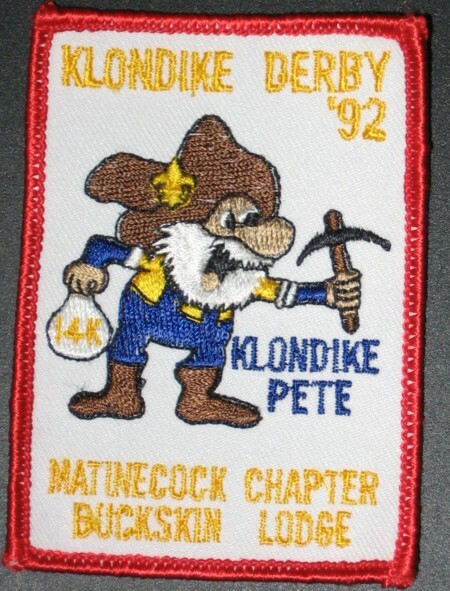 It was for the 1992 Klondike Derby.